Have you had enough? Too many asthma attacks, too many half-hearted attempts at control - and a steadily worsening condition? Have you decided it's time you did something more than merely "put up with it"? If so, you've turned a corner in handling your medical problem. You're ready to stop suffering - and take command. As always, your first marching order must be to learn as much as you can about your condition, to be well-equipped with the facts. The first thing you have to accept is that asthma is a disease, and not the psychosomatic condition myths and fiction describe. Many cases of asthma do start in childhood. In fact, it often comes and goes by the later teen years. But the disease is no heavy age discriminator. It affects 1 person in 25 overall and 1 child in 10. Fact is, no one knows exactly why asthma happens. Heredity often does play a role, though in several cases there's no family history. Allergies can trigger attacks, and there's also evidence that air pollutants can contribute. Occupational asthma - exposure to certain chemicals in the workplace - can also affect adults. Nonetheless, asthma sometimes just can't be explained. Likewise, while the medicines for the management of asthma have improved considerably over the years, there's still no silver bullet. 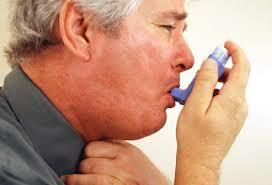 As a result, asthma appears to be becoming more common, and the death rate is on the rise. True, it's not as high compared to the death rate in diabetes, cancer or heart disease. But asthma deaths have the distinction of being unnecessary. Most experts believe asthma shouldn't be fatal. After all this time, however, nobody really knows for sure why asthma occurs - only what happens when it does. So, successful asthma treatment is more a matter of careful management than of finding a cure. And to successfully manage this lung disease, it's helpful to understand how the system works. During normal breathing, air enters through the nostrils and washes against mucus in the air passages, where the fluid traps most impurities, such as germs and dust. At the same time, the cilia (tiny hair s in the nasal passages) remove old mucus and a good and a good deal of other contaminants. When they reach your windpipe, mucus and captured impurities are coughed back up. Swallowing sends the mixture down to the stomach, where the acid digestive juices work them over and eliminate them from the body. The windpipe, or trachea, extends downward from the voice box (called the pharynx). This tube then divides into two bronchi - one into the left lung, the other into the right. The bronchi then divide again and again into smaller and smaller passages which are surrounded by tiny bands of smooth muscles. Eventually they become microscopic. Finally, at the end of these tiny bronchi (or bronchioles) we reach tiny, balloon-like sacs known as alveoli. Here oxygen and carbon dioxide are transferred to and from the blood as the alveoli expand and contract while you breathe. Three things happen during as asthma attack to disrupt this process. If it's an allergen slips past the defenses and into your "hypersensitive" airways, and the bronchi become irritated. The inflammation, in turn, causes the muscle bands around the bronchi to tighten, narrowing the passages and restricting air flow. At the same time, the irritation produces more mucus and also swelling of the cells. The result: a very narrow lumen (the diameter of the bronchi), which results in an asthma attack. Why some allergic people have asthma and other allergic people don't is a mystery, and to date no one has found a cure. But the experts finally have found ways to manage the disease. When both drugs are judiciously combined and taken regularly as a preventive course - rather than just when you have a problem - the combo has been found to keep the air passages much clearer and more open. Of course, the right regimen of drugs is of little help without full patient cooperation. Communication comes first. Talk about the course with your doctor. And keep the communication lines open. If you decide to stop a medication for some reason, let him know about it. Second is education. Something as simple as knowing when the inhaler is empty is extremely important. Shaking it is not enough. Submerging it in water to see if it floats (empty) or sinks (full) is best. And it's vital to have a back-up in case you miscalculate. Third is pulmonary function testing to objectively measure how you are doing. The two most effective tests are spirometry and the peak flow monitor. The first measures how well air is moving in and out of the lungs. The second measures the maximum air you can blow out. By measuring peak flow every morning you can get an idea what to expect from your lungs throughout the day. If you fall below the baseline you set for yourself, you can call your doctor and add a little extra medication to help you get through a particularly rough day. A fourth and perhaps most important goal is allergy avoidance. Know what you're allergic to, and keep your contact with it to an absolute minimum. With the correct use of medication, you can be in charge of the asthma. Asthma shouldn't keep you from carrying on a normal life. But control only comes with the understanding that this is a complex disease requiring a lifetime of commitment top one's health. The rewards are significant: Life becomes richer without asthma in the way.